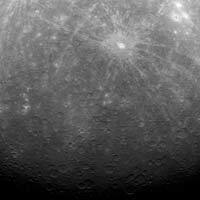 Of Interest: Early this morning, at 5:20 am EDT, MESSENGER captured this historic image of Mercury. This image is the first ever obtained from a spacecraft in orbit about the Solar System's innermost planet. Over the subsequent six hours, MESSENGER acquired an additional 363 images before downlinking some of the data to Earth. The MESSENGER team is currently looking over the newly returned data, which are still continuing to come down. Tomorrow, March 30, at 2 pm EDT, attend the NASA media telecon to view more images from MESSENGER's first look at Mercury from orbit. The dominant rayed crater in the upper portion of the image is Debussy. The smaller crater Matabei with its unusual dark rays is visible to the west of Debussy. The bottom portion of this image is near Mercury's south pole and includes a region of Mercury's surface not previously seen by spacecraft. Compare this image to the planned image footprint to see the region of newly imaged terrain, south of Debussy. Over the next three days, MESSENGER will acquire 1185 additional images in support of MDIS commissioning-phase activities. The year-long primary science phase of the mission will begin on April 4, and the orbital observation plan calls for MDIS to acquire more than 75,000 images in support of MESSENGER's science goals.